Fruit of Kings: Enjoying sake and tapas and the trendy, minimalist Pipa. Gentrification isn’t all bad. There are upsides. The increasingly fashionable Rose Park area isn’t known for its upscale eateries. But that may change. The recently opened Pipa Asian Tapas & Sake Bar is as hip and trendy as anything you’d find downtown—downtown Los Angeles, that is. Located in a shopping center on 900 West—just south of the Fresh Market grocery, and adjacent to East Sea restaurant—Pipa is deceptive from the outside. Walking up to it, you’d never suspect that behind the front door there’s an ultra-cool lounge with a minimalist backlit bar, subdued lighting from hanging rice paper lamps the size of beach balls, sofas in addition to regular restaurant tables and chairs, flat screen TVs showing sports and anime films, and music. The constant beat of electronica and lounge music (think Hotel Costes) that accompanies even lunch makes Pipa feel and look much more like a stylish nightclub than an Asian eatery. But, once you dig into the menu, you discover that this place really is about the food. Pipa—which refers to an ancient Chinese fruit, the “fruit of the kings” that was so rare it was consumed only by royalty—is very relaxing. It’s hard not to fall into a type of trance, thanks to the mood-setting lighting and continual music beat. So, as you peruse the menu, you might relax with one of the restaurant’s two-dozen sake-based cocktails, such as the Cucumber Cooler, Electric Lemonade, Supa Fly, Sake Mofo, Speed Racer or Lychee Fizz. There’s also a small but reasonably priced wine and beer selection. Tables are each set with an artful “tower” of black cloth napkins, cleverly sculpted around chopsticks; again, minimalist but eye-catching. I suspect that someone involved with Pipa has a background in design, because everything—from the signs on the restroom doors to the food itself—is designed for maximum eye appeal. Inside this restaurant, you certainly don’t feel like you’re dining at a shopping center. The outside world seems far, far away. The menu is brimming with Asian-fusion tapas. But although they’re tapas, the portions are generous. 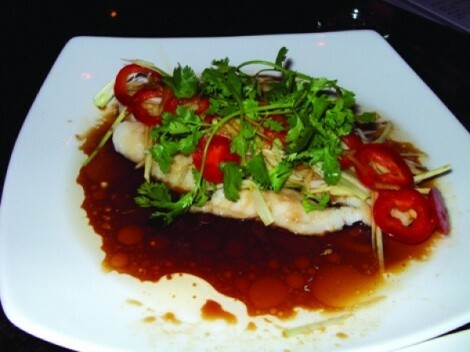 A filet of Siamese shark ($7.95), for example, would suffice as an entrée in most restaurants: a large, boneless filet steamed in a ginger-soy broth and topped with a colorful arrangement of cilantro leaves, cucumber sticks, scallions, and sliced, bright red bell pepper. The fish was wonderfully fragrant, flavorful, and oh so tender. I find timing sometimes to be a problem in tapas-style restaurants. Too often, all the dishes arrive at once. So I was pleased when David, our server, asked if we’d like to have everything delivered to our table simultaneously or spaced out. We chose the latter, although there was some overlap. A healthy place to start is with the tofu and avocado “medley” ($5.95), which is silken tofu and garden-fresh veggies in a zippy ginger vinaigrette. The “Pipa Wings” are appealing, too ($5.95): chicken wings in a choice of five-spice rub, Asian honey, hot & spicy, or Jamaican jerk sauce. Another nice dish to nibble is the XOXO noodles ($4.50). This is a combination of chow mein and chunky rice noodles, deep fried and served with a red-orange XO dipping sauce, flavor-packed with spicy chiles and garlic. I tried for a time to eat the crispy, crunchy noodles with chopsticks but finally gave up and resorted to using my fingers. Eating quail with chopsticks is even more challenging, but worth the effort … okay, I confess to also eating the quail with my hands, once it cooled down enough to handle. The quail ($7.95) at Pipa is described on the menu as “whole quail.” Well, it was—whole, that is. But it was actually two whole, roasted quails, perched upright on the plate, with a crispy crust and served with delicious chile-lime sauce. The quail alone was a little bland. But, once given the chile-lime treatment, it sang. One of my favorite tapas was “Shaken Steak Cubes” ($6.95). This, again, would have made for a generous entrée at most restaurants. It’s a dish of three-quarter inch cubes of marinated, boneless sirloin beef, grilled to crispy perfection and served salad-style with grilled onions, tomato wedges, greens, cucumber and cilantro. I couldn’t get over how tender the tasty beef morsels were. Don’t eat meat? Then order an “Aubergine Stack:” eggplant rounds layered with vegetable ravioli and drizzled with black bean sauce ($5.95). In New York City, I used to frequent kogi Korean barbecue restaurants, which feature grilled meats. And, in Los Angeles, there’s a famous fleet of Kogi Korean barbecue food trucks that sell Korean dishes fused with Mexican. So, I’m guessing that’s where the word “gogi” comes from at Pipa. There’s a choice of either gogi sliders (on mini buns) or gogi tacos ($4.75), which I opted for. It’s a marvelously messy plate of three open-faced tacos, served Mexican-style on corn tortillas, with tender, pulled pork shreds, lettuce, red onion and a zesty aioli. As they say about pizza in New York: It ain’t any good unless there’s grease running down your sleeve. After all those delicious dishes, I was pretty much cooked. But then—going the one thin mint route—I decided I had to try the shrimp hadouken ($4.95). I am, after all, a trained professional. Hadouken refers to the fireball or blastwave formed from a martial artist’s life energy (ki/chi). Hence, hadouken shrimp, which are balls of mashed shrimp, deep-fried and served like pack-with-flavor fireballs. Simply delightful. At Pipa, I’d relished the fruit of kings.